BRAVO SPEECH, MR. PRESIDENT! GREAT PERFORMANCE AT A MOST EMOTIONAL AND TRYING TIME. HIS SPEECH SO UNITES THE WORLD THAT "THERE IS NO OPPOSITION PARTY"! Title: BRAVO SPEECH, MR. PRESIDENT! GREAT PERFORMANCE AT A MOST EMOTIONAL AND TRYING TIME. HIS SPEECH SO UNITES THE WORLD THAT "THERE IS NO OPPOSITION PARTY"! NEWS BRIEF: "President Bush Addresses A Joint Session of Congress and the American People", September 20, 2001, Personal Account, watched on CBS. And, take it back they did. While the plane nosed headfirst into the ground in rural Pennsylvania, it did not crash into the White House, nor into any other target in either Washington, D.C., or in New York. These men are true heroes, in the deepest sense of the word. But, when my wife told me that Lisa not only has two children to raise, but is expecting another child, due in January, I wept again. When I heard President Bush hold the values up high that are synonymous with American greatness, I wept. Freedom, honor, resolution, and staying power over the long haul rang true to me. These great values, born of a people who have traditionally honored the God of the Bible, rang in my heart; even if many Americans seem to be abandoning God and His Son, Jesus Christ -- the true source of these fundamental values -- I could feel proud again for one night. * "Whether we bring enemies to Justice or Justice to our enemies, Justice will be done." * "These misguided Islamic terrorists are following the path of Nazism, but will end in history's grave of discarded lies." * "How do we fight to win? Every resource, every necessary weapon, every intelligence effort"
* "We will pursue the nations who provide safe haven for these terrorists. Either nations are with us or they are with the terrorists. Either they are with us, or they are against us." * "Any nations who offers support to the terrorists is considered hostile." * "The hour is coming when America will act." * This is not just America's fight, but the fight of world's civilizations. Those who believe in freedom and tolerance ..."
* "Terror unanswered threatens the legitimacy of governments throughout the world, and we will not let that happen." * "What is expected of us? To live your lives and hug your children." As I thought of my 5-year-old adopted Danny, and my two grandchildren, I cried again. "Finally, continue praying. Prayer will help strengthen us for the journey ahead." * "This country will define our times, and not be defined by them. This will be an age of freedom, not terror or fear. Freedom and Fear are at war." * "We are going to rally the world to our efforts. We will not tire, we will not falter, and we will not fail." * "... the outcome is certain. God is not neutral between Freedom and Fear." "May God grant us wisdom and watch over the United States of America." In my 55 years, I have never heard a speech I felt was more powerful. Even President Kennedy's speech where he challenged Americans to "not ask what their country can do for them, but ask what you can do for your country", was not as powerful as this one. Truly, Americans have every right to express our emotions of grief and loss at a time as this. We have been attacked by Islamic extremists with whom we have never had any quarrel, at least from our side. We lost upward to 10,000 people whose only "crime" was going to work Tuesday morning [September 11] in the World Trade Center or at the Pentagon. The terrorist perpetrators slashed the throats of passengers and pilots, they stabbed passengers and stewardesses, and then they drove 757 Jumbo Jets into a fiery death. On the ground, over 300 innocent firefighters and their New York City Fire Superintendent, were killed when the towers collapsed. Since this tragedy, Americans have watched the valiant rescue workers trying to uncover victims still alive. We watched as some of the rescue workers were themselves trapped in falling debris, and were injured. We have heard the stories of over 600 children in Jersey City School District alone whose parents did not pick them up in the afternoon of September 11, and of the dozen or so children who lost both father and mother in the World Trade Center fiasco. Yes, our emotions are running high and wide, and you cannot blame us for uniting behind a charismatic President who boldly and competently held forth the best of the American values that have made us great, all except for the fact that he never mentioned the name of our beloved Savior Jesus Christ. Somehow, substituting the vague concept of 'God' does not carry the same weight as 'Jesus'. Yet, President Bush did make us proud tonight. As we go to bed, we can bask a little longer in the glow of America's great past, as it casts its long pleasant shadow over our present. Yet, tomorrow, [Friday, September 21] we will wake up to the reality of what is really happening and to which ultimate goal this President is really leading us. Tomorrow, we need to put our emotions aside and think our way through this problem. The fact is this: President Bush is leading this world into a global fight against terrorism that will unite the major resources of all the governments of the world; and, where governments unite on a common threat, they might just unite in government. We might just get a global government out of this campaign against terror, exactly the kind of global government of the Book of Revelation: Global Dictatorship . Isn't this exactly what President Bush is attempting to do here? Using a "threat" called terrorism, he is attempting to "bring humanity together in a one-world government" called the New World Order. Tomorrow morning, Friday, September 21, 2001, this is the reality with which thinking men and women everywhere must confront. From the morning after this speech, moving forward, Americans must think their way through these problems, and not just react emotionally. If we react emotionally, we may be like lemmings who willingly march off the cliff because their leader told them to do so. When you read those news stories of how closely linked Presidents Bush, Clinton, Bush Senior, and Carter were with the very terrorist groups against which we are now fighting, think of Bill Cooper's revelation: "invent an artificial threat". In the greatest tradition of the Hegelian Doctrine of Controlled Conflict Producing Controlled Change , we have built the terrorists up, financed them, and allowed them the opening to strike -- all so we can go to war against them. Global Dictatorship is the goal. That is the reality we must face tomorrow [Friday] morning. Speaking of secret societies, President George W. Bush has admitted he is a Skull & Bones man, saying rather flippantly that Skull & Bones was part of the "life's experiences who made me as I am today". [CNN.com, August 1, 2000] After this admission that he was, and still is, a Bones Man, you have to ask what kind of secret society is Skull & Bones. We thoroughly research this subject in NEWS1314, and we invite you to read it, for this information will cast President Bush into the kind of true light we all need to see him in. 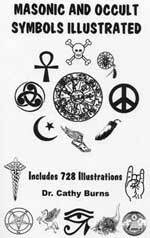 You see, Skull & Bones is part of a global group of secret societies called the Brotherhood of Death Societies. The German Brotherhood of Death Society is called The Thule Society , and its members systematically and thoroughly trained Adolf Hitler into the deepest recesses of Black Magick Witchcraft! Therefore, when President Bush says that Skull & Bones is part of his "life's experiences who made me as I am", you can more easily comprehend just what kind of experiences of which he is speaking! President Bush announced that he was establishing a Cabinet-level position he called, "Homeland Security", and that he was appointing Governor Tom Ridge of Pennsylvania as its director. While Bush was deliberately vague on what this new security apparatus was going to be, I have a very bad feeling it may turn out to be a "Security Service" that will ultimately turn on the very American citizen it is originally supposed to protect. We shall have to watch carefully to see what kinds of powers are given this Homeland Security, and attempt to preserve our freedoms in the midst of this campaign to stamp out terrorism. When President Bush quickly stated that we need to give law enforcement all the tools they need to stamp out terrorism, are we talking tools that will allow big government to aggressively intrude into the lives of individual American citizens, instead of those big and bad terrorists? Already, we are hearing reports that Congress has been asked by the Bush Administration to unleash Carnivore and Echelon upon us, in the name of freedom from terror. We need also to be sensitive to the definition of the word, "terrorist". Today, that word means an Islamic militant intent upon striking America from within, using conventional and unconventional means. Tomorrow, that definition might change, to reflect anyone whose views contradict the government. If this occurs, then every threat President Bush made to the terrorists tonight might suddenly be applied to anyone who disagrees with the President. We have already seen this redefinition in what constitutes a "hate crime". Throughout his Administration, President Bush has quoted Scripture, convincing many Americans he is a Born Again Christian. But, quoting Scripture and making a claim does not a Christian make. Both Bill and Hillary Clinton have quoted their share of Scripture, and yet no one is thinking of them as Christian. As I have read much satanic and New Age literature, I have been both appalled and amazed at how much Scripture they quote! Even Satan quoted Scripture accurately when he attempted to persuade Jesus to throw Himself off the top of the Temple in order to prove His divinity. Jesus replied to this Scripture-quoting fake: "Thou shalt not tempt the Lord Thy God". Tragedy usually brings Americans back to their Christian roots. During the Depression, and during World Wars I and II, fundamental churches were quite full, and people got on their knees to Jesus Christ. And, Jesus heard and delivered this nation. However, during this tragedy, people turned to a different god; they turned to an Ecumenical god, where Protestants, Catholics, Muslims, Jews, and New Age adherents, all filled churches where they could each pray to "God" -- their own god. Pagans worshipping in the ancient cities of the Middle East each prayed to his or her own god, so this outpouring of prayer to their own god is a return to ancient Babylonian type religious practice. Pay attention to what people do, and where they are attempting to lead you, not to their rhetoric, to their overflowing words. Every dastardly failed government program in the 20th Century was foisted upon us by beautiful rhetoric, a rhetoric that proved as empty and as false as a mirage. Every change Adolf Hitler forced on his people was accompanied by beautiful rhetoric. Therefore, as you awake tomorrow morning, give yourself a reality check. Despite his wonderful rhetoric on this night, Thursday, September 20, 2001, our admitted Skull & Bones President is still on track, leading the world into the prophesied global government of the Book of Revelation.